1 photograph: color print: 6" x 8"
Photograph depicts Bernie Simpson and a large group of unidentified people. Bernie is in the back row, ninth from the right. 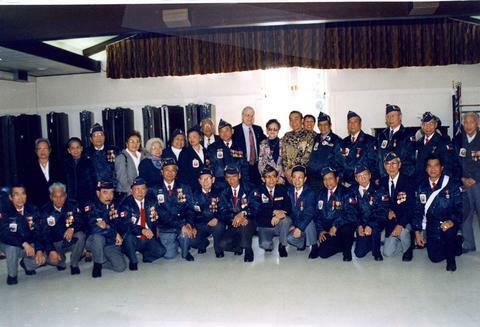 Many of the men in the photograph appear to be wearing veterans uniforms. This is likely a Filipino-Canadian event, possibly a Philippine War Veterans & Ex-Servicemen of British Columbia event. Written on verso: "April 29, 1995 - To: Our very good friend MLA Bernie Simpson - With this memorable photo, we wish you well". Below the writing on the back of the photograph are a number of illegible signatures.